Casino Cruise is Operated by Exodus Media N.V. Casino Cruise games are guaranteed fair, the site uses advanced encryption technology and the highest security protocols. Casino Cruise is powered by a multi-vendor gaming platform which includes Microgaming, NetEnt, Vivo, Play 'N Go and Nyx. South African players can enjoy a tailored gaming experience with customised currency options for deposits/withdrawals and promotional offers. Plus there is also the option to enjoy Casino Cruise in multiple other languages, including: Swedish, Finnish, Norwegian, German and UK English. As far as games go, there are over 600 quality online casino games on offer. These span the full spectrum of slots, video poker, live casino games, roulette, card games, table games and other games. Casino Cruise provides players with a wide range of bonuses and promotions. These are good for newbies and seasoned players alike. 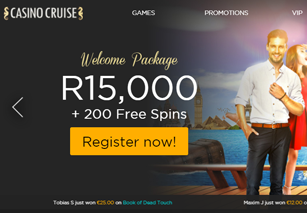 As a new South African player, you qualify for a generous welcome bonus package: R15,000 Welcome Bonus and 200 Free Spins. This promo offer is available over the course of your first 4 deposits. For example, if your first deposit is R3,000, you will earn a matching deposit of R3,000 as part of the 1st deposit bonus. The wagering terms and conditions of these bonus offers are clearly listed alongside the offers. The Second Deposit Bonus (50% up to R3,000) offers added incentive for players to make an additional deposit on site. The Tuesday Pool Party offers players the chance to increase their balance by 25% up to R1, 100. Other offers include the Monthly Splash Bonus, the Friday Freebie, the Win a Dream Cruise Vacation, and other offers. Customer support is available 24/7 from Casino Cruise . Players can access friendly and helpful support staff at the click of a button. For starters, support is available via live chat, email, telephone and FAQ. Customer support reps are fully engaged with players on all technical, banking and gaming-related issues. There is also a helpful FAQ section that allows players to get solutions to standard questions at their leisure. MasterCard, Visa, EntroPay, Diners, Fundsend, Visa Electron, Visa Debit, Switch, Solo, Maestro, PostePay, Euro 6000, Dankort, EcoCard, Ukash, PaySafeCard, Bank Transfer, WebMoney, NeoSurf, and Bank Transfer.